Cheer on the Raiders and give your child some training attire with these Canberra Raiders NRL Youth Supporters Rugby Shorts from ISC. Canberra Raiders play their rugby in Austalia's premier rugby league competition, the National Rugby League NRL. The club has won 3 premierships, (out of 5 Grand Finals played), received 1 wooden spoon and had a total of 15 of its players (9 New South Wales Blues and 6 Queensland Maroons) selected to don the green and gold for Australia. Since inception, the Raiders' team colours have been lime green and white with blue and gold bands. The lime green was chosen as the main colour as it differentiated the side from the colours of other clubs. The blue and gold were included in the Raiders colours as they are the traditional sporting colours of the Australian Capital Territory. The Raiders kit manufacturers have been ISC since 2003, a collaboration with no signs of slowing. These shorts are predominantly white with lime green detailing down the sides of the short and a small amount of blue and gold. 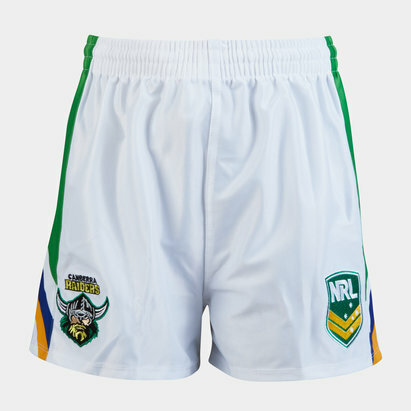 The NRL logo is on the left of the shorts and the club badge on the right.